For over 20 years, M. Jeanne Trott has helped injured individuals throughout the Manchester area seek workers’ compensation or government benefits. As a seasoned lawyer, she brings zealous advocacy and substantial experience to all of her cases. Her past work reflects a high level of determination and attention to detail. Ms. Trott can help people who are applying for Social Security Disability Insurance (SSDI) or Supplemental Security Income (SSI) benefits for the first time as well as those who are appealing a rejected claim. SSDI is designed to help people who cannot work due to a medical condition that is expected to last at least one year. Benefits are paid monthly on a long-term or permanent basis, depending on the person’s disability. SSDI may be available to workers who have accumulated a sufficient number of work credits. The number of required work credits depends on how old you were when you became disabled. These recipients are considered “insured” because they worked for a certain number of years and contributed to the Social Security trust fund in the form of FICA Social Security Taxes. Additionally, to be eligible for SSDI, you must be “disabled” according to the Social Security Administration’s definition of the term. Benefits are available to people with severe, long-term, total disabilities. Severe includes conditions that interfere with basic work-related activities. Long-term means conditions lasting at least one year. A total disability is a condition that prevents a person from performing “substantial gainful activity” for at least one year. Before filing your SSDI application, it is important to gather all necessary documentation for the required forms. 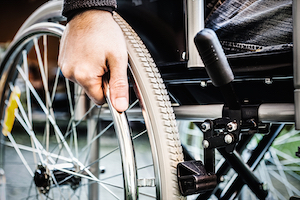 Medical documents and a physician’s opinion confirming the existence and severity of your disabled condition can be critical components of your application. While SSDI does not depend on the income of the disabled individual, SSI only applies to recipients below the administratively mandated income threshold. These individuals must stay below that threshold to continue receiving SSI. Children under 18 with disabilities are also eligible for these benefits. As a need-based program, it has nothing to do with a person’s work history and strictly deals with financial need. Many initial claims for Social Security benefits are denied. Appeals for SSDI and SSI must be presented to the agency in a timely and well-organized fashion. You must request a review of the denial within 60 days of receipt of the denial letter. In New Hampshire, Social Security has shortened the process of appealing a denied claim for benefits. Typically, the appeals process includes four steps, including reconsideration, Administrative Law Judge (ALJ) hearings, Appeals Council review, and litigation in federal court. The reconsideration step has been eliminated on a temporary basis to try to make the appeals process faster. Thus, if Social Security denies your application, you can request a disability hearing in front of an administrative law judge immediately without having to ask Disability Determination Services to review the denial. Injury attorney M. Jeanne Trott can help New Hampshire residents pursue Social Security benefits and appeal claims that have been denied. Contact her office today at (603) 624-7500 or use our online form to set up a free consultation. Ms. Trott assists residents of communities throughout New Hampshire, including Bedford, Auburn, Candia, and Gosstown.